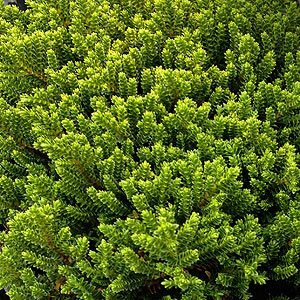 Low growing shrubs such as Hebe varieties that flower and have good foliage are always in demand from landscapers, and Hebes do offer great variety in both flowers and foliage. Hebe plants and shrubs are a hardy landscaping plant that once established are reasonably drought tolerant and trouble free. Some are tight mounding plants with small foliage, other have larger foliage, large flowers and a more open growth habit. With wholesale growers offering new varieties every year, these plants offer landscapers and gardeners many choices. Foliage varies from green, both light and deep green to green with red tones as well as some with silvery foliage. Hebe are used widely as a landscaping plants and being hardy evergreen shrubs are much in demand. They grow in full sun to part shade and will flower in late spring through to summer. Generally easy to prune and tolerant of a range of soil conditions. From low growing ground cover types to varieties suited both as low hedges and flowering feature plants these are a versatile group of plants. Wholesale suppliers can provide a wide rage of Hebe species and cultivars suitable for both the home garden and broader plantings. H. ‘Wiri Splash’ and others.